Brief: Cities are becoming important hubs for innovation as we look to solve humanities toughest challenges. But low civic engagement creates a barrier between government and its people and the potential of new solutions to make a positive impact. In Austin, civic participation is weak and trust of the government is at an all time low. My Role: Along with two teammates I was one of the lead researchers on this project to better understand the barriers to civic engagement in Austin. I designed or co-designed all artifacts and acted as the facilitator, assistant, or note-taker for all interviews we conducted. We conducted an end-to-end research project from initial exploratory research all the way through ideation and concept validation. Below is a diagram of our process, each step of which I'll go into more detail in the text that follows. Before we began recruiting participants, we conducted some preliminary work to better understand the landscape of civic engagement in Austin. How does our local government operate? Who does engagement work? Who are the people participating? and how? How do low income Austin residents think about and connect with local government? For several months my research team and I rode buses, visited libraries, attended meetings at city hall, and knocked on doors in order to meet Austinites and ask them about their "civic lives". We worked to attain a well balance sample group of people to speak with. We spoke residents both male, female, of varying ethnicities and incorporated subject matter experts into the mix, as well. The following are the two most common methods we employed. This form of research simply means that we immersed ourselves in new civic experiences. We attended neighborhood meetings and community parties, went to City Hall, and made a trip to the polls. We documented all of these activities, wrote down our own experiences, and observed the behaviors of others. An added bonus was that we were able to meet and recruit some participants for our research that we met at these events. Contextual inquiry is a powerful form of research because it allows us to form a more complete picture of a person's story. Instead of inviting someone for an interview at my office, we meet them in the context of their own lives - in their living rooms or at their place of work. Beyond just what they tell me in an interview, I'm able to see, smell, and feel the contents of their environment and observe how they interact with it. In this way, I come to understand them more completely than I would otherwise. After meeting with over 60 people through our research, my partners and I spent hours synthesizing all of the data points we collected. We relied heavily upon the use of affinity diagramming all throughout our research process. This method allows us to keep all the data we've collected visible as we hunt for patterns and themes across individual statements. By looking at each statement and asking "what does this mean?" we were able to find connections across individuals and develop insights. Concept models are a great way to visualize and understand a complex system. There are many types of concept maps, from cultural maps, to systems maps, but I really enjoy using concept maps to visualize how different themes intersect. We used journey maps to understand the difficult and intimidating process of speaking at City Hall. The journey map below was a synthesis of our own experience signing up to speak at City Hall and that of our participants. Ultimately, we decided to focus on 2 main groups of people we found. 1. Those that are unaware. We intercepted a man named Mike at a coffee shop during our research, and met many very similar people - those that don't think at all about local government at all. Austinites often live without any conscious awareness of how the city works around them. They don't vote, they don't attend meetings, and they believe it would be boring or pointless if they did. So why take the time? However, when Mike learned he had a district and representative, and saw a picture of his representative, he lit up. "This is my representative? I didn't even know he existed!" Later on in the conversation he told us, "You know, you've got me thinking, maybe I should start getting involved." Through multiple experience like this, in which apathetic residents took an interest, we realized that there is a basic level of civic confidence required in order for people to feel comfortable taking part in civic life. 2. Those that are interested in engaging, but lack access. "I wonder if they even want to hear from us residents?" The second group of people we encountered were those that did have an interest in local government and tried to reach out to share their thoughts and concerns. We met a woman named Sarah that said, "I'd love to be more involved, but with my two kids attending meetings isn't going to happen." Another woman named Jennifer decided to go speak to city council about an issue in her neighborhood. While she stood at the podium to speak for her three minutes a camera projected her face onto a large screen. The council members sat behind their podium and didn't respond to her remarks. The experience is intimidating and unreasonable for the majority of residents, given the difficulty of the whole process (see journey map). Yet City Hall is portrayed as the best channel for connecting with city leaders. Jennifer left City Hall with a question, "I wonder if they even want to hear from us as residents?" This lead us to learn that even those who are motivated to engage, aren't set up for success within the current channels. The next phase of our work, ideation and prototyping, built off of two main insights. 1. Lack of basic civic knowledge discourages engagement, causing changes within the city to be mistrusted or ignored. How might we connect residents to the civic functions surrounding them, build civic confidence, AND set them up for success? We conducted several rounds of ideation using different provocations and techniques, to generate over 200 ideas. Some had promise and some were ridiculous, but the exercises were necessary to help our brains start to think about solutions in new ways. The Austin is Me truck deploys from city hall to visit neighborhoods, capture voices, and bring people together. Our first concept sought to create an in-person experience within neighborhoods. We called this concept the "Austin is Me" Truck, which was inspired by a quote from one of our research participants. From talking to low income residents we knew it was easier for many of them to develop trust in a face-to-face interaction versus through a digital device. We prototyped a block party to simulate the interaction of the truck. Our imagined outcome was that residents would get out of their homes, mingle with their neighbors and be primed to voice their opinions. Early prototype of the "Austin is Me" Truck concept as a block party. Unsurprisingly in hindsight, people did not want to leave their homes at an unexpected knock on the door. The entire interaction felt very forced. The interception of residents while they are engaged in other activities was a big barrier to overcome and didn't scale easily. A website however, would give access to more people at a time when they are open to participating. So we quickly built a website on Wix. The first site focused on gathering input and visualizing the data so residents could learn what others care about across town. We sent out surveys to assess the type of responses people gave to very open questions. 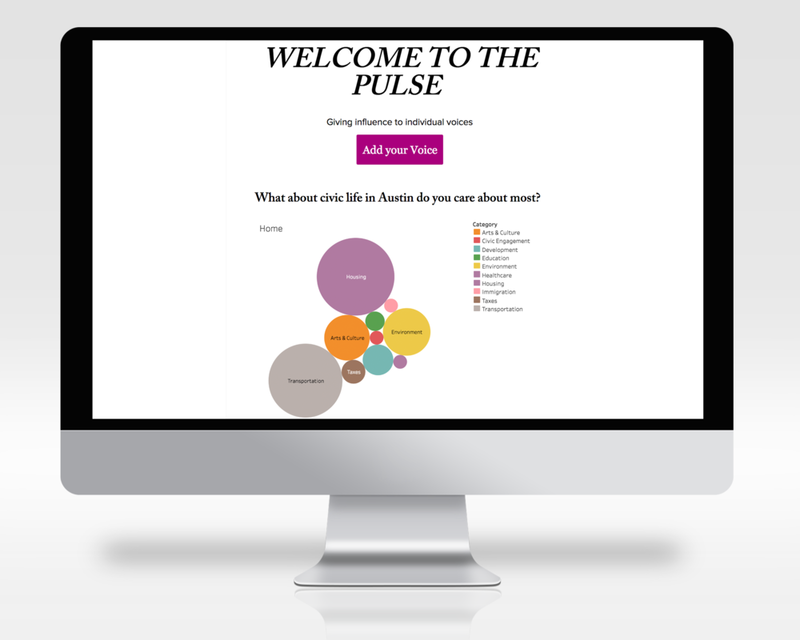 First iteration of the website showed the topic categories our survey participants chimed in on. The website had some merit, but as we tested ways to gather input and work to develop all the features we wanted, the concept's form started to lend itself more and more to a mobile application. We were working off of the insights that 1) people don't feel like government relates to them and 2) residents can't see how government functions in the places they spend time. A mobile application allows for a more personal interaction and alerts residents to civic happenings that are relevant to them. Phones are very personal. We carry them with us wherever we go. What if your phone alerted you to civic happenings in the places you pass through and love most? Ultimately, people loved getting updates on city happenings through their phone. We sent messages out to a group of 40 people, and 90% of these "users" engaged with the content we sent them. A mobile application was the best form for accomplishing our goal of making civic participation a no-excuse exercise for huge population of silent Austinites.